"On the afternoon of 7 October, while on normal Sea Tiger patrol, PCF's 61 and 69 were destroying fishing wiers on the Truong Giang River about 17 miles southeast of Danang (BT 188 487) when they received heavy semi-automatic (S/A) weapons fire. The "Swift" boats withdrew to the northwest and saturated the area with 81mm mortars and then made a .50 caliber strafing run on the enemy positions. After rearming both units proceeded north to exit the Truong Giang River when they received heavy automatic weapons, semi-automatic and 57mm recoilless rifle fire from bunker positions. 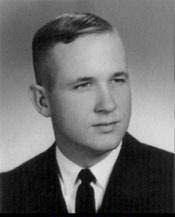 In the general hail of fire, the helsmen, Officer-in-Charge of PCF 61, LTJG Kenneth Dean NORTON, USN, 717895/1100, was killed and PCF 61 ran hard aground while traveling at full speed. At the same time, both "Swift" boats received 57mm R/R rounds close aboard resulting in minor damage to PCF 69 and punctured the port fuel tank of PCF 61 causing minor flooding. Both units suppressed the enemy fire. PCF 101, helo gunships and a "dustoff" helo arrived on the scene at 1310H. The helo gunships saturated the area with rocket and mini gun fire while LTJG NORTON was MEDEVACED. PCF's 69 and 101 pulled PCF 61 free at 1600H and proceeded without further incident to Coastal Group 14 headquarters, with the helo gunships providing cover. There were 20 structures destroyed in the operation. One U.S. sailor received a minor wound, was treated, and returned to duty. Enemy casualties are unknown."